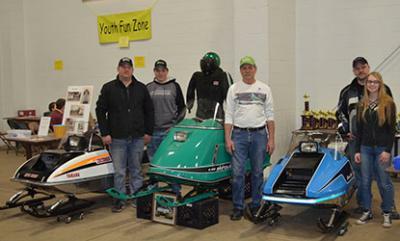 Brent Wendlandt and Taygen Koch from Glencoe, left, showed off their restored Yamaha on Saturday at the Crow River Sno Pro’s Vintage Sled Show and Swap Meet. Also pictured is David Jutz, middle, who worked on his sled with his daughter, Taylor, not pictured. Brandon and Ashlyn Karnik, right, were the third parent-child team displaying their restored wreck.